This night the universe holds its breath, with all creation straining to see physics shattered and entropy reversed. Is what was promised coming to be? Over and over he promised, “and after three he days shall rise again.” Will it be? Can it be? I was not there when when he breathed again, his cold, dead flesh bringing in the breath of life. I was not there when took off the wrappings of the tomb. I was not there when he folded them up and placed them on the cold, dark stone. I was not there when the rounded stone doorway rolled away. I was not there. But I believe it happened. I was not there when he felt the dew on his pierced feet. I was not there when the rays of light broke over the horizon and he saw not just a new day beginning, but something altogether new. A new age. A new Adam. I was not there when the women were searching for answers, when he told them what was to happen all along. I was not there, but their faith was handed down to me. I was not there when he walked with the followers on the way to Emmaus. I was not there when he explained the Scriptures, detailing how all that had taken place was what was meant to be. No accidents had transpired in Jerusalem that week. I was not there when he was invited in, and broke bread. I was not there when the followers’ eyes were opened. I was not there, but I believe it took place. I was not there at the foundation of the world when God put everything in order and called it good. I will not be there at the end when all things will be worked together and once again declared good. I reside in the in-between, when all the good and all the bad and all the God and all the us are intermingled and are a mixed-up, messed-up botch. And on this night, we await to see if what is promised will come true. God, who began this good work, will be faithful to complete it. And we, with all creation, holding our breath, will see in fullness and truth. Our faith will no longer have to be faith, because we will see with our own eyes. We will see face to face. Tonight as we remember what came before, and made promises of our own, renewed baptismal promises, we claim to be a part of this story, the beginning, the middle and the end. We come tonight knowing the rest of the story. But it is not boring or redundant. We keep photo albums to remember the treasures of our lives. And tonight as we wade through the Scriptures, from Creation to re-Creation, we look to the story, HIS-Story, and our part in it and its parts in us. We hold our breath not out of anticipation of what could happen, but rather we hold our breath out of understanding that what we are about to receive is the most important thing that has ever happened and will ever happen. What happens this night is the linchpin of all Creation and Time itself. And because we believe we can say this. And because we believe and can say this, we can live it. And when we live it out, others can see it alive in us, can see him alive in us and the story begins again. And the universe holds its breath asking, “And can it be, all over again?” Amen. You are what you eat. We have heard that all of our lives. You eat junk, you are junk-y. You eat healthy, you are healthy. "Let food be your medicine," said Hippocrates. But every week, we come to this table with the invitation of Jesus himself. "Take, eat, this is my body broken for you." "Take, drink, this cup is the blood of the new covenant shed for you." These words are horrifying to some. Many accused the early church of cannibalism from a literal hearing over these phrases. From the Jewish and middle-eastern perspectives, nothing could be more anathema. In the blood is life. You never consume the blood, and Jesus knew this. He knew this and yet he intentionally said this, going smack up against the cultural, social and biblical understanding of those who followed him. His words are many things, but they are not simple, nor can the be ignored. We come on this night, to this table, remembering Jesus. This Jesus we claim was God in the Flesh. This Jesus we claim to take away all the things in us we wish never were, those things we hide so deep down we want to deny their very existence. This Jesus who took off his garment, wrapped himself in a towel and cleaned the feet of those who were his followers, the learners and future leaders of his way of connecting to God. You see, when we come to this table, we say we are taking him, his way of living, and thinking, and yes, even being, into ourselves. If we are what we eat, when we come to this table we come not just to receive, but to become. We are being converted bit by bit as we work out our faith with fear and trembling. And remember what we are taking in. Jesus, who humbled himself and took on the role of a servant. "Do you know what I have done for you?" he asked of them and us. As he kneels before us and removes the gunk and grime of our lives so we can continue to walk in his way, do we take this in, too? You are what you eat. And we come this night and every week, consuming all that Jesus is and taking on all that we can be in him. We also come to this table knowing the rest of the story. On that Last Supper night, those around him did not know the rest of the story. When we hear him say "This is my body," we see in our minds his broken body on the cross. When we hear him say, "This is the blood of a New Covenant," we see his blood flowing down. In light of what was to come, this night, this table, this bread and wine become all the more weighted with meaning. We are what we eat. We take on that night as well as the next day. As we come to this table, all are welcome. All are welcome to take him in. All are welcome to become. And at this table, Jesus takes what is there, the simplest of things. Things that would have been at almost every meal that they had ever eaten. When I went to Cuba, we had rice and beans two out of three meals. When I lived in Germany, Brötchen, little crusty rolls, were there most of the time. In Jesus day as in most of the West, Bread was the sustenance of life. Wine was something safe to drink in a land of questionable water. On every table these would have been present. He did not send his disciples out for something special, like caviar and champagne. He did not send them out for sushi and Sake(SAK-ee). He took what was there at hand and used it. Thank goodness, because that means he can use us, too. We are here and like he transformed the elements at hand, he can transform us, too. He can take us if we are too raised or if we have fallen flat. He can take us if we are too sweet or if we have turned sour. He takes us as we are and makes us into his hands and feet in this world that needs his life-giving and life-changing message still. Margaret Mead called for social change saying, "Never doubt that a small group of thoughtful, committed citizens can change the world; indeed, it's the only thing that ever has." But she had nothing up on Jesus, as he looked around that table and commissioned his faithful band of misfits and rejects to whom he was entrusting the life-giving treasure of the world, his Gospel. And because they took his message and his example we are here tonight, bathing each others' feet becoming servants like him and coming to this table in remembrance of him. Thanks be to God. We are what we eat. Will we be what we eat this night? Amen. There are some days where the unexpected comes in, dark, surprising, crushing even. We need reminders even to breath. But when I have had experiences times like that, a single ray, a light from something or somewhere will break through. In seminary, I had a professor who talked through this idea. When he was young, growing up in the country, he slept on the west side of the house. The light breaking through from the east would creep under his closed door, and fan out in different directions, from a single ray it would spread and disperse as it diffused under the door. A single ray started to fill his whole room, and it grew as the sun came up. When I've had those moments of hope, even in the darkest of times, the brightness of it compared to the darkness was overwhelming. It the crushing dark could take the breath away, the arrival of hope comes like a buoy when one expects to drown, a comfort when the pain seemed too great. And in the receiving, the hope is a moment of Grace,a reminder that God is God and all will be okay. We may have no way of seeing beyond that darkness, but the light is coming from somewhere. "The light shines in the darkness and the darkness has not overcome it." And that light has to come from somewhere. And that somewhere is close by. It is at hand, even. That is the thing to remember. Even though we walk through the valley of the shadow of death someone is with us. We are not alone. In the dark it is hard to feel that, much less remember that. Thank you for the reminder, today. "And sweetest- in the Gale- is heard-"
Bloom is speaking here about when we lay out our souls naked. Others may squirm or look away, but when we are at that point of baring it all, emotionally, spiritually, whatever, in these moments we may be able to glimpse our truest selves. These moments are the ones beyond what we do, and they actually define who we are. These are moments that do not make rational sense, they only make sense with the sense of the heart. Mary, I believe, did that this day. She opened up and did not think about the cost. 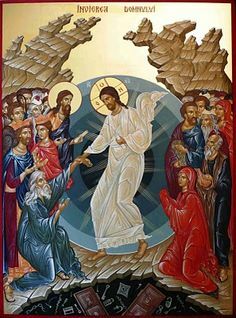 She, in her ecstatic joy over her brother’s resurrection, tried in a tangible way express to Jesus how she felt about what he had done for her. In anointing his feet, she bared her very soul. I have seen bumper stickers extolling the “Practice [of] Random Acts of Kindness and Senseless Acts of Beauty.” This could not be more different. There was nothing Random about this. There is nothing Senseless about this. She was intentional and deliberate. Maybe we should learn something from that. People, had they been able, would have stopped her. So many social norms were being broken here. She uncovered her hair. No, no, no. She touched someone, a man, to whom she was not related. No, no, no. She took an extravagance, something worth close to a year’s wages, and poured it out like it was water. No, no, no. I think she was not stopped because there was a quality about her that would not have been stopped no matter what. She was beyond herself that day, expressing perhaps her truest self, as Bloom intimates. She went forward to the Master and knelt at his feet. She uncovered her hair, and used it as a towel to clean the dirt and grime from the road off of Jesus. It is said that the uniqueness of humanity is that we are the storytelling creature. Other animals share information, but we build our lives around stories. You are sitting in a room listening to me talk about stories. When our family arrives home, we ask, “How was your day?” Narratives drive our understanding of our lives. We even see narratives when there are none sometimes, we so long to find a meaning and purpose to our experiences. Think of the great stories of our culture, the ones that resonate and ring true in cultures around the world. These tales are the ones that are repeated and recycled and handed down from generation to generation. And I would argue that the ones that are people’s favorites are the ones where we see these Points of Grace, whether fictional or real. 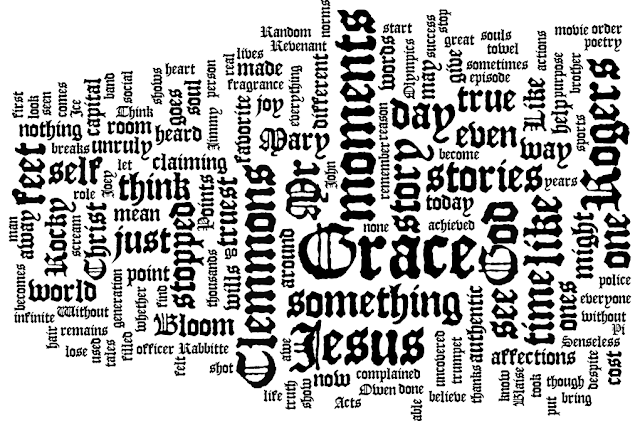 What do I mean by Points of Grace? I mean those moments when we see someone being who they were created to be break forth. I mean those moments when despite all the world being against them the individual triumphs, often at great risk or cost, and will not be defeated even if they lose. For brevity’s sake, let’s just look at a few examples. Sports come easily to mind. Think of those moments when it all comes down to one play, make it or lose. All the pressure, all the hopes for and all the curses against, the shot goes up, the buzzer sounds, and collectively thousands hold their breath while they wait to witness the impossible. The shot goes in and the thousands jump up or cry or scream, or all three at once. Why do we care so much? Because sports are a metaphor for life, whether we like them or not. Little bite-size encapsulations of being alive, where there are set rules and determinable outcomes. And that is why we remember these Points of Grace in sports. When injured Kerri Strug landed on one foot in the ‘96 Olympics to win the Gold Medal. Wow! We even give them names sometimes. The Miracle on Ice from the 1980 Olympics. The Ice Bowl from Green Bay in 1967. The Catch from Joe Montana to Dwight Clark in 1982’s NFC Championship game between the 49ers and the Cowboys. These moments when the miraculous (loosely used there) is seen. But the movies and books we remember most are the same, as well. There is a reason why Rocky 7 is in theaters now. It might be called Creed, but everyone knows it is Rocky 7. At the end of Rocky, the first one, he loses the fight, but gains the world. He did not back down or give in when everyone and everything was stacked against him. Even in his defeat he won. He was his truest self. He did not quit. He was a rock, he was Rocky Balboa. And that is why we keep going back, hoping for that moment of Grace. In Star Wars, the first one, Luke Skywalker lets go of his fears and becomes his true self, claiming the Grace that was his to receive. And they made 6 more. My favorite novels are no different. In A Prayer for Owen Meany, Owen is fulfilling the call of God as he understood it without thinking of the cost. In The Life of Pi, Pi Patel believes and gives his suffering a purpose and bigger vision by claiming “the better story.” In Les Misérables, Victor Hugo’s masterpiece, we see Jean Valjean so ultimately converted that he is willing to do anything to fulfill the Bishop’s claiming of his soul. We see through these stories which point to that Grace that underlies the hunger of our souls. I think on the times when Grace has captured our news. The man on Air Florida Flight #90 out of National airport on January 13, 1982, and the victims floating in the frigid waters of the Potomac. Three times a man passed on the rescue rope from the helicopter so that others might live. And his acts of enabling others to live were the last things he did on this earth. The tank man in Tiananmen Square on June 5, 1989, who stood alone against a line of tanks to try and stop them entering to open fire on student protesters. I think this yearning for Grace is at the base of the heart, and that is why it is the root of our favorite stories and tales, and the basis of the images that haunt us years after the event. God breaks through when we, the very image of God, the imago Dei, open ourselves to being who God made us to be. And when Mary comes in with that pound of nard, she becomes Thanksgiving incarnate. Her actions scream to all there in the room the joy and thankfulness for what Jesus has done. The Revenant (and thanks to the movie so I can use that word and people might know what it means) the Revenant, her brother, sits there in the room watching her give thanks in the most honest of ways. She says thank you with her whole self. John goes on to say that “The house was filled with the fragrance of the perfume.” These points of Grace are like that. They permeate us all. They pluck our heart strings. They speak to us about the reality we hope and pray is true. Like the perfume’s fragrance, when Grace breaks through it fills the space. There is no getting away from it. Joey, the wizened trumpet player: Look, I know you're hurtin' now, but in time you'll realize what you've achieved. Jimmy Rabbitte: I've achieved nothing! Joey: You're missin' the point. The success of the band was irrelevant - you raised their expectations of life, you lifted their horizons. Sure we could have been famous and made albums and stuff, but that would have been predictable. This way it's poetry. Mary’s actions that day were poetry. No one stopped her because she was unstoppable. There are a mere 4 stories that are in all four of the Gospels. The baptism of Jesus by John. The Confession of Peter that Jesus was the Messiah. And this story. The anointing of Jesus feet. While the details may be different in the various versions, the truth of the story remains the same. In Mark’s account, Jesus even says that wherever his story is told, this story will be included. I think this impressed Jesus, too. And while we stand in awe, and think how wonderful Mary is, how might we be like her? Not in doing what she did. Jesus is not here, and our brother was not just resurrected. But in Christ, how can we be our truest self? On Friday, I heard a moving piece on NPR from Francois Clemmons. He played a police officer on Mr. Rogers’ Neighborhood. He began in 1968, after Mr. Rogers heard him sing in church. He offered him a role on the show. Clemmons, being African-American, felt uncomfortable portraying a police officer, as he put it “having grown up in the ghetto” not to mention the racially charged atmosphere of 1968. He did take the role, and portrayed Officer Clemmons for years, 25 I think. One poignant episode, Mr. Rogers was dipping his feet in a wading pool on a hot day, and invited Clemmons to join him. Clemmons said the sight of the skin of their feet next to each other made a strong statement. And then, Mr. Rogers took a towel and dried Clemmons feet. Without words, Mr. Rogers soul came out. Without words, Christ was preached more loudly than from a pulpit. Later, on another episode, at the closing when Mr. Rogers said like always “I like you just the way you are.” After they wrapped up, he walked over to Clemmons who asked, “Were you talking to me today?” Fred Rogers responded, “I have been for years, you just heard me today.” Mr. Rogers’ authenticity finally broke through. The collect from today prays: “Almighty God, you alone can bring into order the unruly wills and affections of sinners…” I would say just that, as we allow God in to bring order to our unruly wills and affections we start to become who we are. And we can start to become who we are because of whose we are. We, like Bloom said, get out of our own way and “From time to time something authentic shows through…” That is my prayer for all of this Lenten day. That we can let go of our unruly wills and affections and not do something, but rather, BE WHO GOD MADE US TO BE. The world may not understand, and that is okay. Acting out of Grace will not make sense to the mind, but nothing could make more sense to the sense of the heart. We are enabled and empowered and expected to let the authentic show through, and when it does the world will be in awe. Like it was with Mary. Like it was with Christ on the cross. Like it can be when you claim your birthright in Christ. Who can we be when the authentic shows through? Amen.